Late Friday night or early Saturday morning (depending on your perspective), I returned from five days at Disneyland. This marked my first visit to Disneyland since the early 80’s. A lot of things of change and I am glad to say that most of the changes were positive. My family and I had a wonderful time at Disneyland. I’ll be sharing my trip report in blog posts over the next couple weeks but today I wanted to share just my overall impressions from the vacation. 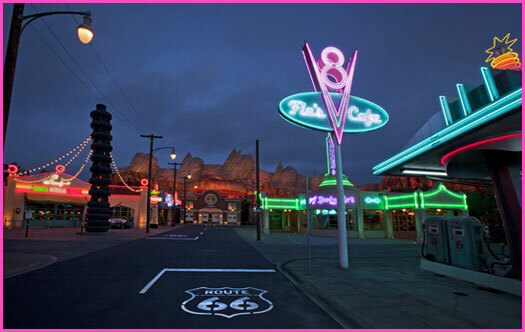 One of the biggest successes at Disneyland has been the addition of Cars Land. Cars Land was completed in 2012 and was seen as the biggest reason why attendance at Disneyland has been on the increase. Cars Land consists of three rides (Radiator Springs Racers, Luigi’s Flying Tires, and Mater’s Junkyard Jamboree) along with three restaurants and three shopping areas. Ever since it’s very popular opening, people have been asking the question: Should another Cars Land be built at Walt Disney World? It’s a great question. Some of the people have even mentally carved out space within Hollywood Studios and mentally closed down attractions to make room for a proposed Cars Land. Let’s lay out the arguments for and against its addition. Disney has finally released some information about 24 Hours Rock Your Disney Side event occurring this weekend. There will be three Move It! Shake It! Celebrate It! parades. The first parade will feature the Disney heroes at 10:00 am. The villains take over the parade at 1:30 pm. Voting will take place throughout the day to see whether heroes or villains will be features in the 5:45 pm parade. The new Disney Festival of Fantasy parade will take place at 12:00 noon and 3:30 pm. The Main Street Electrical Parade will have showings at 11:00 pm and 1:00 am on May 24. The villains will take part in a pre-parade celebrating that “It’s Good to Bad.” Celebrate the Magic will be at 8:45 pm, 9:45 pm, and 11:45 pm. There will be one showing of Wishes at 9:00 am. At 11:00 pm, Princess Fairytale Hall will be taken over by Maleficent and the Queen from Snow White and be renamed Scary Tale Hall. Anna and Elsa will be in the other half of the hall. Around 1:45 am, other Disney villains will take over some the character greeting locations. The most notable will be Jafar instead of Jasmine and Aladdin in Adventureland. Dr. Facilier instead of Princess Tiana and Captain Hook takes the place of Peter Pan. In Tomorrowland, the IncrediblesSuperDanceParty will rock Rockettower Plaza from 4:30 pm to 10:30 pm. Starting at 11 pm, guests can view The Incredibles. Late at night, Cinderella’s Castle will be “Up All Night” and Frontierland will host the Frontierland Dance Party from 2:00 am to 5:45 am. The event comes to a close with a “Special Kiss Goodnight” at the Railroad Station in Main Street USA. I spent a lot of time talking about places to go and things to do when you are at Disneyland and Walt Disney World. This week, I’m going to focus on something just as important….a place to sleep. 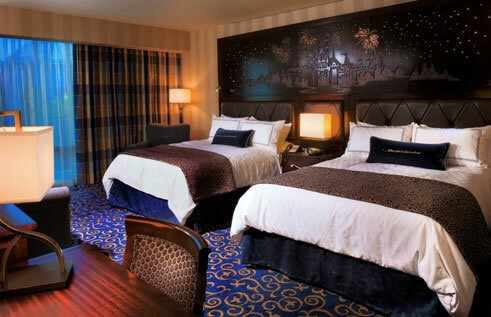 Disneyland and Walt Disney World both provide a variety of on-property accommodations. Given its vast size, Walt Disney World has a lot more options than Disneyland. I will focus on Walt Disney World later this week. Today, I will focus on the three Disneyland on-property accommodations. I will go from the oldest property to the newest. For full disclosure, I have not stayed at any of these properties. My only trip to Disneyland was back in 1984 and I stayed off-property with my family. Above is a panorama view of the Disneyland Hotel which was originally built by Jack Wrather in 1955. The hotel was purchased by Disney in 1984 and underwent a massive renovation in 1999 into its present form. The resort has 990 rooms and the theme is Classic Disney. Standard rooms can accommodate up to five guests with suites available for larger groups.